James Bond Jr ran for 65 episodes, each approximately 25 minutes in length, and first aired on US television on 16th September 1991. 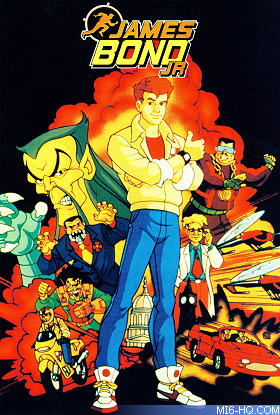 The show follows the adventures of a youthful James Bond Jr (nephew of 007) and his friends as they simultaneously study at Warfield Academy on the south coast of England and tangle with well-known Bond villains. Produced by Murakami Wolf Swenson, Danjaq and United Artists in cooperation with RLR Associates, the show was created for syndication aimed at children's morning television. As such, apart from the first episode that sets up the characters and back story, each adventure is stand-alone and can be viewed in any order. The series was distributed worldwide for television by Claster Television and Camelot Entertainment Group in 1991, and later by Sony Pictures Television International from 2006. Abbey Home Entertainment and MGM/UA Home Entertainment released some episodes of the show on VHS in the UK and USA respectively.